The gentle and effective ProAdjuster might be the right choice for you. What’s that sound? 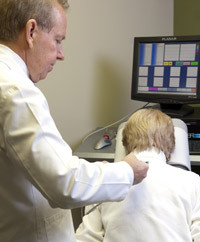 It’s a computerized instrument we use to analyze, evaluate and adjust your spine. It’s revolutionary because it eliminates the need for twisting or torquing the spine. First, in a seated position with your spine comfortably supported, the Pro-Adjuster instrument will gently tap on each vertebra. The computer will sense the “echo” of each tap. A relatively short, flat wave pattern is preferred over a tall, sharply angled wave pattern. With each tap, we can see your body change. When maximum stress reduction of each vertebral joint is achieved, we stop tapping. The resulting improved function and nervous system integrity invokes your body’s own healing capacity. If you’ve ever “tensed up” in anticipation of an impending physical event, you’re the perfect candidate for the Pro-Adjuster approach. Because the gentle tapping is quick and you don’t feel vulnerable, you can relax and enjoy the process. Our patients love it!